Despite the enormous increase in volumes of mail sent in Great Britain during the period 1914-1918 there is remarkably little evidence of war conditions influencing the design or production of postage stamps. Indeed, the 1913 'profile head' issue of definitive stamps was in use right up until 1934 with only a change in watermark in 1924 and periodic changes of colour shade. This was not the case in other countries in the period. Shortages of raw materials affected production of stamps; they were used as means to raise money for charity and the values were themselves changed as inflation affected currency. 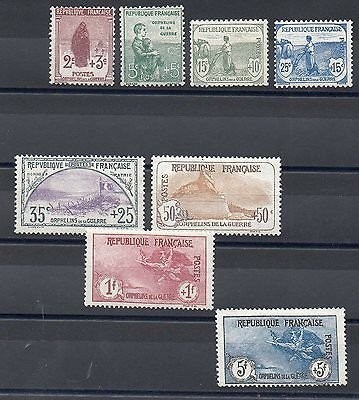 Postage stamps were also required when control and governance of territories changed hands, effects that were continued for many years after the war had ended. In 1914 postage stamps were issued to raise funds for the Red Cross. Initially, only overprinted, the 5c surcharge was soon incorporated into the design. From 1916 cheaper paper was used. Known as 'G.C. papier de Grande Consommation,' it was a greyish granite type paper. 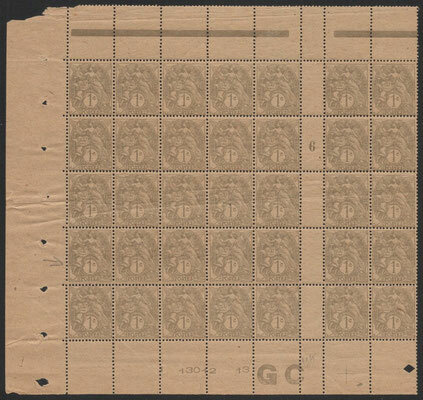 Upper and lower margins of sheets of stamps showed the initials G.C. It was originally intended to use this paper for issues which required large scale printing but it was used for nearly all issues in the period 1916-1920. In 1917 a commemorative series of stamps was issued to support the War Orphan's Fund. Similar stamps were re-issued during the 1920s. The designs by Surand and L. Dumoulin show a war widow,orphans, a woman ploughing, a front line trench, the Lion of Befort and the Spirit of War.